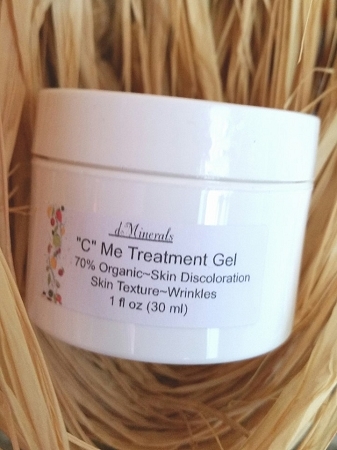 Our "C" Me Vitamin C Eye Treatment is 70% organic . Fades discoloration & sun spots and , refines skin texture and reduce existing wrinkles and help stop new ones. Works gently and effectively on the delicate eye area. Our "C" Me eye treatment gel has one of the highest forms of active, bio-available Vitamin C for gorgeous eyes. Use once a day and follow with the rest of your skin care products. Directions for Use: Dab around eyes..( forehead,neck and cheek area. Can be used as an all over face treatment). Safe to use morning and night. Can be used under makeup also. To Use: Once a day, dab around eyes and upper cheek area. Safe to use morning or night. Apply before your moisturizer. Ingredients: Organic Herbal Infusion, Organic Aloe Barbadensis Leaf Juice (Aloe Vera), Sodium Ascorbyl Phosphate (Vitamin C), Silk Protein Amino Acid Blend (Sodium L-Pyrrolidone Carboxylate, Sodium Lactate,Organic Simmondsia Chinensis (Jojoba Oil), Cucumis Sativus (Cucumber Distillate), LArginine, L-Aspartic Acid, L-Pyrrolidonecarboxylic Acid, Glycine, L-Alanine, L-Serine, L-Valine, L-Isoleucine, L-Histidine, L-Phenylalanine), L-Proline, L-threonine,Methylsulfonylmethane (MSM), Cassia Angustifolia Seed Polysaccharide (botanical Hyaluronic Acid), Hydroxyethyl Cellulose, Carrageenan Gum, Organic Glycyrrhiza Glabra (Licorice), Wildcrafted Vinca Major (Periwinkle), Tocopheryl Acetate (Vitamin E), Sodium Benzoate, Potassium Sorbate, Ethyl Hexyl Glycerin.